Global Brands Magazine features the High Altitude Balloon work of Dhruva Space and Indian radio amateurs. Dhruva Space in association with Indian Institute of Astrophysics is gearing up to observe comet ISON when it passes earth on November 28, 2013 using a high altitude balloon platform. Weekly test flights are in progress as part of the preparations for the ISON observation. On one such flight on October 13, the balloon which was carrying a 5 kilograms payload containing various sensors reached a peak altitude of 21 km and it traveled over 600 km into the Arabian Sea. 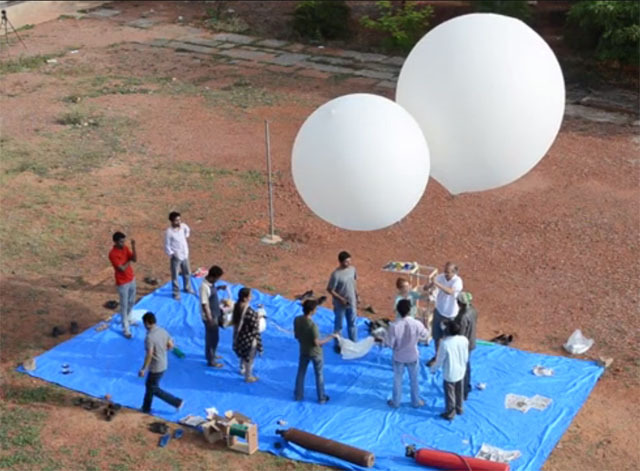 What makes this test flight special is that the ground station at Bangalore and the two mobile payload recovery teams were able to receive the 145.765 MHz FM APRS radio signals from the balloon for over 12 hours without any disruption. Hyderabad based National Institute of Amateur Radio which is one of the program partners has provided immense support in successful post-flight payload recovery. Ham radio operators in Karnataka and Goa in India, and Middle East and Africa were able to receive encoded APRS signals containing real time location, altitude and other operating conditions of the flight.